Situated at an elevation of about 3,680Mts.above sea level, the temple is dedicated to Lord Shiva. Enroute exotic varieties of rhododendrons, while flowers and shrub like trees can be seen in abundance. Kanchula Korak Musk Deer Sanctuary (74Kms.) On the Chopta Gopeshwar road, Kanchula Korak Musk Deer Sanctuary is famous for breeding musk deer.This Sanctuary covers an area of 5 sq. Mts. and is an ideal place for tourists to view rare Himalayan wildlife. This place is also popular for its dense forests and natural aromatic flowers. 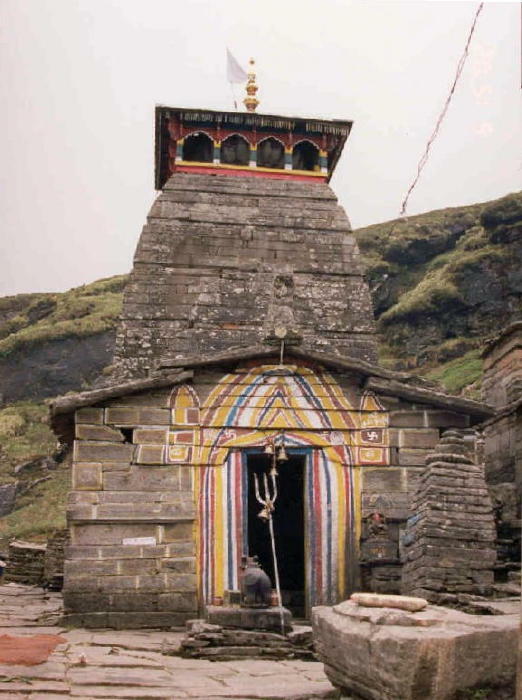 Tungnath is situated in the Chamoli district of Garhwal in Uttarakhand. located at an altitude of 12,070 feet (3680 meters), is the third and highest of the Panch Kedar or five Himalayan temples consecrated to Shiva. It is believed to contain the arm as per the Panch Kedar tradition of Hinduism. All five of the Panch Kedars are mostly accessible only on foot, and each are located at such a great height that they close in the winter, since this is when they become snowbound. The footpath to Tungnath starts at the small town of Chopta, and is a steep walk, reaching over 3000 feet in just 3.5 kilometers. You can hire a horse to ride up to the temple. On the way, you will witness exotic forms of rhododendrons, wild flowers and shrubs. Nestling among temperate forests, the origins of the Tungnath temple are immersed in myths and legends. Locals consider the temple to have been built by the Pandavas to propitiate Lord Shiva, who had been angered by the large scale bloodshed at Kurukshetra. You can take a bus or taxi from Rishikesh via Rudraprayag and Chamoli to reach Chopta, the base camp for the trek to Tungnath. Another possible route is via Ukhimath and Doggalbitta on the Badri-Kedar path. From Chopta, a 3.5 kilometers' trek will land you at Tungnath Temple. 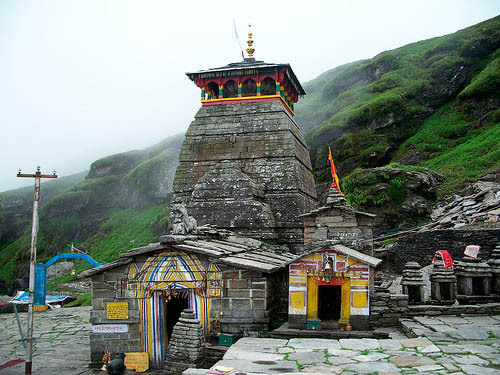 Tungnath is the highest temple of Lord Shiva perched at an elevation of 3,680 mts above sea level. The sanctity of the region of is considered unsurpassed. Tungnath is one of Panch Kedar and Shiva arm is worshipped here. The trek to highest temple of Lord Shiva commences from Chopta. You can reach Tungnath by a 4km easy but steep trek. An hour climb from Tungnath will lead you to from where you can enjoy 360 degree panoromic views of the gigantic Himalayas. Tungnath (3810 m) - Tungnath is the place where the arm (Bahu) of Shiva appeared.. The sanctity of the region of Tungath is considered unsurpassed. The peak of Tungnath is the source of three springs that from the river Akashkamini. At this temple at 3,680 mts, Shiva's arm is worshipped. The highest hindu shrine in the Himalayas, 3kms uphill from Chopta, Tungath is reached through a path that wends through alpine meadows and rhododendron thickets. An hour's climb from here leads to Chandrashila with its panoromic views. The entire journey and the shrine are located in some of the finest, most picturesque pocket of the Himalaya. Tungnath is the highest temple in the world and is one of the five and the highest Panch Kedar temples located in the mountain range of Tunganath in the Chamoli district of Tehri Garhwal, in Uttarakhand, India. The Tunganath (literal meaning is lord of the peaks) mountains form the Mandakini and Alaknanda river valleys. Located at an altitude of 3,680 m (12,073.5 ft), the Tungnath temple is the highest Hindu shrine dedicated to Lord Shiva. The temple is believed to be 1000 years old and is the second in the pecking order of the Panch Kedars. It has a rich legend linked to the Pandavas, heroes of the epic Mahabharata fame. According to Hindu mythology lord Shiva and his consort Parvati both reside in the Himalayas: Lord Shiva at Mount Kailash and Parvati (Shail Putri) is considered to be the daughter of hills. The Tunganath myth is indelibly linked to the origin of the Panch Kedar temples built by the Pandavas. The legend states that sage Vyas Rishi advised the Pandavas that since they were culpable to the slaying of their own relatives (Kauravas, their cousins) during the Mahabharata war or Kurukshetra war, their offense could be pardoned only by Lord Shiva. Consequently, the Pandavas went in search of Shiva who was avoiding them since he was convinced of the guilt of Pandavas. In order to keep away from them, Shiva took the form of a bull and went into hiding in an underground safe haven at Guptakashi, where Pandavas chased him. But later Shiva’s body in the form of bull’s body parts rematerialized at five different locations that represent the “Panch Kedar” where Pandavas built temples of Lord Shiva at each location, to worship and venerate, seeking his pardon and blessings. Each one is identified with a part of his body; Tungnath is identified as the place where the bahu (hands) were seen: hump was seen at Kedarnath; head appeared at Rudranath; his navel and stomach surfaced at Madhyamaheshwar; and his jata (hair or locks) at Kalpeshwar. Legend also states that Lord Rama, the chief icon of the Ramayana epic, meditated at the Chandrashila peak, which is close to Tungnath. It is also said that Ravana, also of Ramayana fame did penance to Shiva, the lord of the peaks, when he resided here. It is an ancient temple built in the North Indian style of temple architecture. It is small in size and can barely accommodate ten people in the sanctum. Surrounding this temple, there are a number of small shrines (about a dozen) of several gods. The sanctum part of the temple abuts the hills where the sacred standing black rock (swayambu or self manifest linga) with tilt to the left, of 1 ft (0.3 m) height, denoting the form of arms of Lord Shiva is worshipped. The construction of this temple is credited to Arjuna, the third of the Pandava brothers, who also worshiped here. Just at the entrance, at the end of the trek path to the temple, there is a gateway with name Tungnath painted on the top of the arch, which is of recent construction. A signage at the gate entrance gives distance to the temple as 4 km (2.5 mi) and also states that pilgrims unable to undertake the trek could leave their donations in the box (kept next to the gate). The architectural design of the temple is similar to the temples at Guptakashi, Madhyamaheshwar and Kedarnath. The temples inside the enclosure are made of stones with decorations painted on the outside and they depict tall towers. The highest dome has a wooden stage at the top. The dome has sixteen openings (pictured). The temple roofs are also made of stone slabs. At the entrance to the temple there is a Nandi stone image facing towards the sanctum where Shiva’s idol is deified. The Nandi’s flank is normally sanctified for worship with flowers and with three lines (tripundra) in yellow clay, with a mark denoting Shiva's third eye, which is symbolic to Shiva's devotees. At the right of the temple entrance there is the mandatory image of Ganesha. 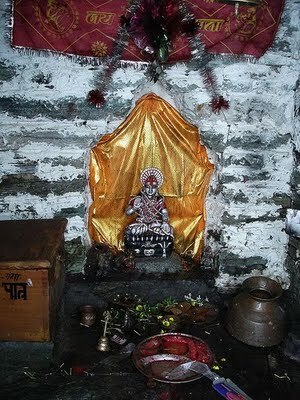 In the main sanctum, ashtadhatu (made of eight metals) idols of sage Vyas and Kala Bhairav (demi-god), disciples of Shiva, are also installed in the sanctum sanctorum. The temple also houses the images of the Pandavas and silver plaques of other four Kedar shrines. Among the smaller shrines, the central temple is of goddess Parvati, Shiva’s consort. Away to the far right there is a group of five small shrines dedicated to the Panch Kedar, which include Tungnath also as one of the Panch Kedar, in addition to the main Tunganath temple. Near the Akash Ganga water fall, close to Tungnath, a temple to Nanda Devi is located to denote that it is descending from heaven. A 2.5 ft (0.8 m) statue of Adi Guru Shankaracharya is installed next to the main deity of Shiva.